John Blevins for FONT Music: How did you first get involved with FONT? What did you perform and with whom? Jeff Kaiser: Originally, it was supposed to be with the LA Trumpet Quartet featuring myself, John Fumo, Kris Tiner and Dan Rosenboom. We contacted Dave Douglas, who was very kind and generous to offer us a spot at Cornelia Street that included me doing a solo trumpet set with my electronics rig. However, the quartet ended up not being able to make it, so I invited guitarist Tom McNalley to join me. Tom and I had just finished ZUGZWANG, the first in my chess series. You can listen to some of it here. It was a blast to play FONT at Cornelia Street, it ended up being a really fun night shared with the quartet of Nate Wooley, Gordon Alley, Reuben Radding and Andrew Greenwald. I noticed it says that [Zugzwang] was recorded live with no overdubs on the pfMENTUM website too. Yes, we were trying to make sure everybody understood that all the audio processing was not taking place after we had played, that it was *not* a studio project, but a live music project. I hadn’t really developed my ideas of hybridity, agency and instruments at that time. We were just trying to make sure everybody knew what we were doing was live. Many people in the ‘90s and the early 2000’s thought that my recordings just featured a lot of studio processing. Live electronics is so much more common now. In the description about the Zeitnot piece, it that says you pre-recorded some sounds from the trumpet—like slides and different valves and movement. Did you pre-record that and sample them? ZEITNOT (see video below) is a new work I developed at UC San Diego during the last year of my PhD studies. I was so incredibly fortunate to work with Joe Kucera, the head engineer at UCSD, and to do these recordings of the inside of the trumpet. For these recordings, the trumpet was not played by blowing et cetera. What you hear is the sound of air being compressed and escaping from slides being moved, the sound of the valves and the springs as they descend, et cetera. We used these really high-end microphones and preamps and put the mics way, way inside the horn so you can actually clearly hear the smallest movements of the slides and valves. I find it quite mesmerizing. I then edited the recordings and made a very large sample library with Native Instruments Kontakt. These libraries are then driven by a group of probability-based generative patches I built in Max. (These patches, by the way, will be released free on my website, sometime soon.) I was in Amsterdam in March (with Trevor Henthorn of my duo www.madeaudible.com) working with the next generation of those patches and ported them to Max for Live plugins to be used in Ableton Live. All of this stuff should be released to the public soon. All of my Max and Max for Live patches as well as the sample library. How did you get in to using [Max/MSP]? Well, I never considered myself a programmer, but first and foremost an artist. But now, here I am a programmer and Assistant Professor of Music Technology and Composition! I am at University of Central Missouri, in a fantastic music tech program (www.ucmo.edu/music/faculty). I actually wrote a paper called, “How I lost a 150 pounds thanks to Max/MSP,” which goes into detail of me leaving hardware pedals for a computer. In brief: I was in London, touring with Andrew Pask, a great saxophone player who also works for Cycling ’74, the company that develops Max. We have a duo called The Choir Boys. Anyway, we were touring and I was carrying all this hardware with me, two cases at 75 lbs. each, and he just had his laptop. Every time we got on a plane or off a plane, on a train, off a train, in or out of a cab, it was like a nightmare for me. I went home and buried myself for six months learning Max and recreated my hardware rig inside of the Max world. That was my entry into it, just recreating phrase samplers and delay lines and stuff like that. I was performing with Max inside of a few months. When I watched the [Zeitnot] video it seems like different sounds you’re creating on the trumpet automatically trigger changes in the video and audio. Does your playing affect coding in the program? There are many interactive elements in the software I wrote: threshold triggers, pitch and volume followers, et cetera. However, for that particular performance of ZEITNOT I could not get the interactive stuff to work simply because I only had access to old computers to run the video. (You can see the iMacs onstage with me.) There are just too many layers of things interacting on each screen for the old computers to handle. I think there is at least at least eight or nine layers of video being composited by Max on each screen live in real time. But I do think there is the perception of relationship between the music and video due to all the complicated things happening simultaneously, something is bound to line up! There is all this interactive stuff going on within the system itself, but in the case of that particular performance the trumpet isn’t doing it. It actually does work interactively with the audio though. The sound of the trumpet, the onset of something, the pitch of something, the duration of something, the volume of something of an audio event, all of these things can control different elements of the video. You mentioned your fascination, your love of chess before; is there an element to [Zeitnot] where you’re competing with the software or competing with the computer in some way? All of these ideas of relationships with technology—from chess to music—for me, point to ideas of system environment hybridity. Where everything is a participant, everything is working together, agency is shared between the participants: I’m not in charge of the computer, the computer isn’t in charge of me. There are all these feedback loops and relationships that I think surprise both of us. Sometimes I feel really surprised. I think sometimes the computer is surprised. Even the performance space plays a role. The trumpet has a role. We’re all together. I don’t view the computer as a mere extension but as this whole hybrid thing, where I’m informing what the computer is doing, the computer is informing what I’m doing, the horn is, the space is…The computer is a performer. It is an important participant. The computer is a player, is a performer. It is a participant helping to make things happen. When you refer in the video description to “ambisonics”, does that mean distributing the sounds you’re creating in surround sound? Ambisonics is a surround sound variant that allows for a sphere of sound around the audience. It is a scalable system for a variable number of speakers. If I have four speakers, I can use four speakers. If I have more, I can use more. The Max patch, using the ICST Ambisonic externals, places and moves the sound through space in different ways. I’ve written some algorithms that will generate patterns of movement, swarming patterns and rotational and random patterns and stuff like that. You don’t hear it so much on the video as it was recorded in stereo. Can you give a brief history of your performing and teaching career? For teaching, I was originally a private music teacher that taught trumpet in the Los Angeles area. Through my friendship with Vinny Golia, Wadada Leo Smith and John Fumo I was able to pick up a few classes at Cal Arts. I found that I loved teaching in the university environment! I decided to go back to school and earn a PhD. I was accepted at UC San Diego, it was the same year that Ed Harkins retired, so I took on trumpet students there and also taught a variety of classes, including history of the Blues, a survey of music from the continent of Africa, Max/MSP and others while working towards my PhD. Upon leaving, I taught digital audio composition, Max/MSP, music theory and other courses at the University of San Diego. I also taught the History of Rock at MiraCosta College. Now, I feel incredibly fortunate to have a tenure-track position at the University of Central Missouri which has a stellar music tech program. I work with the professor that started the program, Dr. Eric Honour (saxophone player/Max programmer/engineer/composer). In addition to the current undergrad program, we will be creating a new grad degree in music tech. This semester I’ll be teaching Max/MSP, Audio for X, Live Production and directed studies. You’ve mentioned playing in London and Amsterdam—have you ever lived abroad? During summer breaks, I have lived in Berlin and Amsterdam for a few months at a time. What a joy to hang out with the people on the scene there. I have been fortunate to perform throughout Europe, in Sweden, Germany, Holland, Spain, the UK, Mexico as well as all over the US. I recently returned from another visit to Amsterdam for an artist residency and a performance, and that was wonderful. I was at this 45-year-old organization called STEIM. The acronym stands for Studio for Electro Instrumental Music. A lot of interesting artists have gone through. George Lewis was the artistic director there for a while. I think he started his Voyager program at IRCAM but finished it at STEIM. A lot of great musicians have spent time there. It’s really neat to be a part of it. Are you mostly performing or teaching there or studying and writing? Mostly creating. They gave us a studio, Trevor and I were working on some plug-ins we’re developing for Ableton Live. I also curated a concert for the Oorsprong Series, in this wonderful space where I played with the great drummer Frank Rosaly and vocalist Han Buhrs. It is a great scene,very active, very creative. Every night there are interesting gigs going on. So what’s the history and mission of pfMENTUM? pfMENTUM grew out of the Ventura New Music Festival (Ventura, California). Keith McMullen and I started pfMENTUM as a newsletter for the festival. Eventually I decided I wanted to have my own record label, and liked the wacky name, so pfMENTUM “evolved” into the label. It is wild to see the way it has developed. Now when you go to the “Artists” page on the website (www.pfmentum.com/artists), and you start adding up all the musicians and engineers and poets and photographers that have been involved, there are well over 400 people. And we’ll be passing 100 releases in the next month. The mission is to keep representing creative music from many different paths, many different places and many different people. It started out as being more regionally focused with a lot of my personal friends in Los Angeles. Now we’ve reached out and are trying not only to represent the established creative musicians—wonderful people like Michael Vlatkovich—but also younger musicians. Maxwell Gualtieri and Louis Lopez—co-directors of pfMENTUM and wonderful artists themselves—have been helping reach out to younger artists. What are your thoughts on the music industry in general with streaming and such? Do you have any strong opinions about Spotify and similar platforms? Our music has always existed in such a small corner of the music industry. All of these technologies and changes in the industry create opportunities for us. But, yes, it’s depressing when you see artists earning pennies, if that, from Spotify et al. But our music doesn’t operate on the same financial level as some music. To talk about what pfMENTUM and other small creative labels do, and to talk about it in the same way that you would talk about Sony and their artists, becomes almost an exercise in absurdity because we’re different. Our music is different. Our audience is different. Our numbers are different. Our reasons for doing what we do are different. It’s a whole different world and if we start comparing with the big corporations, we risk getting really depressed. We do our music as our work and we deserve our income, but in addition to income, it is also a necessity for most of us to be creative forces in this world. To discuss the music industry, in ways, is also to discuss what you value. If we’re assessing what I value, what I value is: creativity, community, and an outlet for creativity. The goal with pfMENTUM is to give people an outlet for their creativity. Making a living is of course very valuable and very important, as is being creative. It is just so difficult to survive on the music alone, so you see many of us taking other jobs as well. Do you see any changes on the horizon for the way pfMENTUM releases music? Do you think… it makes sense to keep releasing physical media? When we started pfMENTUM the industry was still mostly dominated by physical media. I would like to see the product pages also become places where every artist can have their Bandcamp pages as well. It’s not just an outlet for the physical medium, however, I do see physical media as still important. I would like to see pfMENTUM move into a 501(c)(3) not for profit model. The future is funny to plan for, you just don’t know stuff when you’re starting out. I started out with a friend in my apartment and we had these custom recycled cardboard wrappers for covers, with soy-based ink and tied with hemp twine. We would have 1000 printed CDs on a spindle: no shrink wrap, or jewel boxes. All the packages would then be hand-folded and hand-tied, usually by a crew of friends having beers, and then mailed out to critics and radio stations. I didn’t think about “growing” and “the future.” It was really nice, and when we hit thirteen releases in the catalog—folding, wrapping, tying each one—I thought, “This is not sustainable.” So we moved on and changed. Now at over 100 releases it is time for another re-examination as to how to remain sustainable. Believe it or not, I think that physical product is a part of that future, with more small runs of vinyl and cassettes with digital downloads. And CDs. Some people still love them! Maybe 8-track tapes next. But it just keeps going, and so we do it for love of the music, for love of creativity, creative activity and creative people. Do you have any upcoming performances or projects you’d like to mention? I have a new KaiBorg album that will be released soon (www.kaiborg.com). I am very excited about it. I play trumpet and electronics. My good friend David Borgo plays woodwind and electronics. That album is all mixed and ready to go and features some new (and I think adventurous) use of electronics. We have a new release featuring Vinny Golia with Ken Filiano, a Dave Ballou solo trumpet recording, the Mark Dresser DVD is exciting, Scott Walton and Steve Adams duo, and the Matty Harris double septet coming out really soon, which is a big project on digital, vinyl and CD. A lot of fun stuff going on. I also wanted to ask you about the quarter-tone playing you’ve done. It starts with Joe Marcinkiewicz making two quartertone prototypes for Arturo Sandoval (!) Joe made large bore and small bore versions (prototypes for the Rembrandt quarter-tone trumpet). Arturo kept the smaller bore horn. Rob Blakeslee (a fantastic trumpet player who has since retired) worked for Marcinkiewicz at that time and was tasked with finding somebody to buy the large bore prototype horn. He knew I was on the hunt for a quartertone, so they loaned it to me for some sessions and concerts with Vlatkovich (www.pfmentum.com/product/michael-vlatkovich-across-36-continents-pfmcd030 was the first). It was a very reasonable price, and I loved the horn. But I simply could not afford it and sadly returned it to them. Not long after that, I was playing in Vinny Golia’s large ensemble with Rob and he walked into rehearsal and dropped this case in my lap, saying, “Here you go.” I looked at him, he said, “It’s yours, a gift from us.” I am so grateful, I love that horn so much! So you went down the path of learning to use quarter-tones after getting the horn? That is correct, I had been looking for one and Rob knew that. I had been looking for a long time because I’ve been a fan of Don Ellis—I love his quarter-tone stuff! That rock big band stuff was never really my thing, but I just respected him and all of the players so much. I loved the sound of his quarter-tone and the trumpet section playing quarter-tones. I’d been looking for one for a long time and that is how Rob knew to talk to me because we had talked about it. He was the one who told me Holton made all the quarter-tones for Don Ellis and that the Holton rep would bring them to the rehearsals and gigs and then take them back afterwards. They were never left in the hands of the musicians. So they could not be found later. Thankfully, there are creative trumpet builders like Joe. My last question is, are those your teeth in the dental x-rays on Zeitnot? They are. It is a panoramic x-ray of my mouth. I also have an MRI of my head that haven’t used yet that I’m going to use as well. It’s really freaky. I had some work done on a tooth and something happened with the muscles and nerves. There is something going on and I battle numbness on the lower right side of my chops. ZEITNOT was the first real big performance since that happened, so I felt like including that as a theme. I still have ongoing problems. I have been poked and prodded, had x-rays and MRIs. I don’t know what is going on—neither do the dentists and doctors I’ve seen—but I keep playing as best I can. 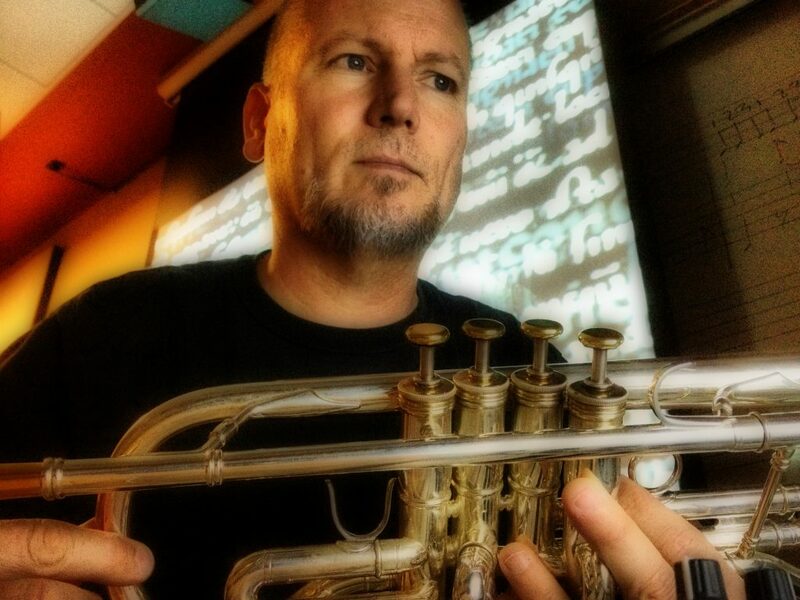 Jeff Kaiser is a music technologist, trumpet player, composer, conductor, and scholar. Classically trained as a trumpet player, Kaiser now views his traditional instrument as hybrid with new technology in the form of software and hardware interfaces that he creates for his performances and recordings. Kaiser gains inspiration and ideas from the intersections of experimental composition and improvisation and the timbral and formal affordances provided by combining traditional instruments with emerging technologies. The roots of his music are firmly in the experimental traditions within jazz, improvised and Western art music practices. Kaiser considers his art audio-centric, but he also works with live video, tracking and interactive technologies. He regularly performs throughout the United States and Europe, and his work is featured on Clean Feed Records, Leo Records, NineWinds, Cuneiform Records and his own label, pfMENTUM, among others. Embracing the idea of being an artist/scholar, Kaiser has also presented at national conferences, including the Society for Ethnomusicology, the International Society for Improvised Music, SPARK, and invited presentations at colleges and universities. His scholarly work ethnographically explores contemporary musicians who use new, repurposed and reinvented electronic technologies, and critically examines how these musicians conceptualize their practice. He is particularly interested in changing notions of agency, instruments and virtuosity, and how artists, audiences and critics construct what is valuable and desirable in these emerging fields. In addition to documenting how creative individuals configure technologies for their own purposes, Kaiser argues that technologies can also configure musicians and musical communities by affording specific ways of creating sonic and social value.